I hope you are enjoying The Mother-Daughter Book Club Festival that's taking place this week on Booking Mama! Today, I'd like to welcome Heather Vogel Frederick, author of The Mother Daughter Book Club series which includes THE MOTHER-DAUGHTER BOOK CLUB, MUCH ADO ABOUT ANNE, and DEAR PEN PAL to Booking Mama. I am so glad that she took time from her very busy schedule, both as a mother and a writer, to answer a few of my questions. Make sure you check out my other posts: Review: THE MOTHER DAUGHTER BOOK CLUB and Book Club Exchange: Cindy Hudson & Huge Giveaway. Tomorrow, I will be featuring Cindy's new book that is a must-have for all members of mother-daughter book clubs, BOOK BY BOOK: THE COMPLETE GUIDE TO CREATING MOTHER-DAUGHTER BOOK CLUBS. And don't forget to enter my Mother-Daughter Book Club giveaway! Two winners will each receive a copy of BOOK BY BOOK as well as five sets of THE MOTHER-DAUGHTER BOOK CLUB series!!!! Booking Mama: How did you decide to write THE MOTHER-DAUGHTER BOOK CLUB? What was your inspiration? Heather Vogel Frederick: The initial spark for this book actually came from my editor. She called me up out of the blue one day and mentioned that there were mother-daughter book clubs springing up all over the country. “I think it would be fun if someone were to write a novel about a club like that,” she said. “How about you?” She knew that I had spent a good part of my growing up years in Concord, Massachusetts, where Louisa May Alcott lived when she wrote “Little Women,” and so we decided to set the book there and have “Little Women” be the first book that the club tackled. And I took it from there. As for the inspiration, I drew a great deal on my own middle school years, and my own experiences living in that historic town. Booking Mama: I know that you are the mother of two boys, but you write so well about girls and especially mother/daughter relationships. Why do you think you have so much insight into middle grade girls? Heather Vogel Frederick: I know – isn’t it ironic that I of all people should end up writing about a mother-daughter book club? My sons think it’s hilarious! I’m asked this question a lot, and in thinking about it, what I’ve come to realize is that although things change on the outside over the decades and even over the centuries – fashions, popular music, popular culture, etc. – what’s on the inside remains largely constant. The emotional truth of adolescence hasn’t changed all that much from the time when Louisa May Alcott was writing about Jo March, or from when Lucy Maud Montgomery was writing about Anne Shirley. I have vivid memories of my own adolescent years, and it hasn’t been all that difficult to tap into those underlying emotions as I write about my characters navigating middle school and life in a broader sense. As for the outer trappings, the things that do change over the decades, well, I have nieces and friends with tween daughters, and I do a lot of quiet observing and listening. Booking Mama: THE MOTHER-DAUGHTER BOOK CLUB is the first book in this series (Book 2 - MUCH ADO ABOUT ANNE and Book 3 - DEAR PEN PAL). Did you always know that there would be sequels when you wrote this one? Booking Mama: Since you have sons, you obviously aren't in a mother/daughter book club. Are you in any type of book club? Heather Vogel Frederick: I was in a book club when my boys were babies, and it was a real oasis for me. After we moved to Oregon, though, I was too busy wrangling a toddler and a kindergartner to find another one, and then the years got away from me. I was recently asked to join one, and I think that with both our boys in college now, I’m at a point in my life where I’m ready to be involved in one again. Booking Mama: As a member of a Mother/Daughter Book Club, I think these books are just perfect for young girls to read and discuss! I see that you have met with many book clubs to talk about your books. Can you share with us a highlight or two from these meetings? Heather Vogel Frederick: Oh honey, I’m in it for the cupcakes and the hugs! My husband says it’s my reward for raising two boys. Seriously, though, it’s been SUCH fun to visit with girls and their moms – mostly via Skype, but occasionally in person if the club is local. One highlight occurred last year when I surprised a book club in Missouri. A mom emailed to see if I could Skype with them, and it just so happened that I was planning a visit to my best friend, who lived nearby. I couldn’t resist, I emailed back and said Skype would be fine, but how would she feel about a real live visit? So the two of us came up with a scheme to surprise the girls. You should have seen the looks on their faces when I walked in! Books, reading, and writing are such an important part of my life, and I love being able to share this with young readers. They always have great questions, and their enthusiasm and excitement sets me up for days. Writing is solitary work, and talking to book clubs is just plain fun! Plus, I hope I’m able to inspire my readers a bit, as writers who have shared their time with me over the years have helped inspire me. Booking Mama: Are there any future plans for more Mother-Daughter books? What are you working on now? Heather Vogel Frederick: I just finished writing the fourth book in the series, which will be published in September 2010. It’s called “Pies & Prejudice” – three guesses what the club will be reading! By this time, my fictional girls are in 9th grade, so I figured they were finally ready to tackle Jane Austen. There will be a fifth book as well, which will have more of a holiday theme – I’m planning to tuck recipes and crafts and such in with the story itself. I’m about to start writing it, and it doesn’t have a title as yet. Booking Mama: THE MOTHER-DAUGHTER BOOK CLUB has a lot of references to the novel LITTLE WOMEN. The girls not only read this book, but they also live in the same town that the author lived -- Concord, MA. How did you decide to tie in your books with specific novels? Heather Vogel Frederick: Well, I do know that this is somewhat of a departure from reality, the fact that in my novels, the fictional club focuses on a single book for the entire year. Most book clubs I know devour a book a month. I chose to suspend reality on this point, though, as I thought it would be interesting to allow readers to really get to know an author, and a particular book, in-depth. I knew I wanted to use classic novels, because it was a chance to share with readers some of the books that I loved when I was growing up, books that I feel deserve to be kept alive and become part of every girl’s “mental wallpaper,” if you will. There’s a reason that they’re classics! There’s a reason that we all still love Jo March and Anne Shirley and Elizabeth Bennet. Booking Mama: What are some of your favorite books for young girls? Do you have any book recommendations for Mother/Daughter book clubs? Heather Vogel Frederick: Oh wow, there are so many great books out there – it’s always hard to know what a particular group’s tastes are, though, when it comes to recommendations. Shannon Hale’s books are wonderful, and for older girls I also love Joan Bauer’s novels. I definitely recommend checking out Cindy Hudson’s “Book by Book: The Complete Guide to Creating Mother-Daughter Book Clubs,” along with her website www.motherdaughterbookclub.com – both offer extensive reading lists. There’s also a chapter in “The Double Daring Book for Girls” by Andrea Buchanan and Miriam Peskowitz on mother-daughter book clubs, and a recommended reading list at their website www.daringbookforgirls.com. Booking Mama: I can't let an interview go by without asking what you are reading now? Heather Vogel Frederick: I don’t have as much time these days to read as I used to, unfortunately. That being said, I have a stack of books on my bedside table that I’m eagerly looking forward to: Molly Gloss’s “The Hearts of Horses” (adult fiction), “The Evolution of Calpurnia Tate” by Jacqueline Kelly and “When You Reach Me” by Rebecca Stead. Heather Vogel Frederick grew up in New England and spent her middle-school years in Concord, Massachusetts, the town where THE MOTHER-DAUGHTER BOOK CLUB stories take place. 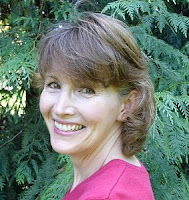 Today, the award-winning author of the Patience Goodspeed books and the Spy Mice series lives in Portland, Oregon, with her husband, their two sons, and the family's beloved Shetland sheepdog. Booking Daughter and I absolutely adored THE MOTHER-DAUGHTER BOOK CLUB -- you can read our review here. I can't stress how enjoyable I think these books are, and I highly recommend them to anyone who has a middle grade girl in their life! I want to thank Heather for stopping by Booking Mama and answering all of my questions. If you'd like to learn more about Heather and her books, make sure you check out her website. I love that surprise visit! How great was that? I don't have a daughter either, but I like the classic books that the girls in the club are reading, so I may have to take a look at these books. I hope Heather gets a granddaughter one day - she certainly deserves one. She and her books sound so delightful. I apologize as I am late in responding to this post. I am the leader of the mother daughter bookclub to which Heather made the surprise visit!! I cannot tell you what a memory-in-the-making that experience was for our bookclub girls. They were stunned and in awe of the author of our very first bookclub book standing before them in the flesh! What a special person Heather is to have made the visit. She spent very precious, quality, one-on-one time with our girls. None of us will ever forget it. Cannot wait to read the new book and upcoming books as well!